Copyright © 2005 by e-cookbooks.net All Rights Reserved. e-cookbooks.net is a Division of VJJE Publishing Co. Trim beef; cut into serving−size pieces. Place in a greased 13 x 9−inch baking dish. Sprinkle with pepper. Top with onion, mushrooms and tomato sauce. Cover and bake for 1 3/4 to 2 hours or until meat is tender. Serve over noodles. Serves 8. 209 calories, 112 mg sodium, 68 mg cholesterol, 4 gm carbohydrate, 26 gm protein, 10 gm fat. Diabetic Exchanges: 3 lean meat, 1 vegetable. 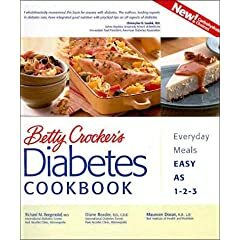 Betty Crocker, America's most trusted friend in the kitchen, has teamed up with the International Diabetes Center (IDC)--one of the leading medical centers--to create an indispensable source of easy-to-make recipes and up-to-the-minute food and nutrition information for the growing numbers of people who have diabetes, more than 15 million of them. 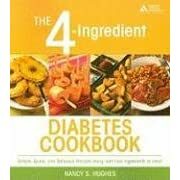 Here is the first cookbook to include recipes featuring Carbohydrate Choices--the new, simplified approach to meal planning recommended by the American Diabetes Association. For people who find diet exchanges too hard, too limiting or too much work, this new method is a real breakthrough. Each of the book's 140 recipes shows the number of Carbohydrate Choices per serving, so that planning the rest of the meal is easy. From Old-Time Beef and Vegetable Stew to Creamy Vanilla-Caramel Cheesecake, the recipes are made with everyday ingredients, including sugar. No food groups or ingredients are left out, so there's no need for anyone to feel deprived or restricted to a special diet. Food exchanges are also included, making it easy for those who still count calories. 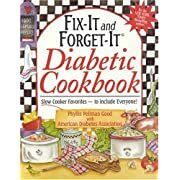 Fix-It and Forget-It Diabetic Cookbook: Slow-Cooker Favorites to Include Everyone! Hughes, author of cookbooks health-minded (The 1200-Calory-A-Day Menu Cookbook) and otherwise (The New Chili Cuisine) pulls off a challenging trick in her latest, devising more than 100 tasty recipes with only four ingredients that also satisfy the American Diabetes Association's dietary guidelines. When limiting ingredients, the first casualty is depth of flavor, but Hughes employs a variety of tricks to correct this, like lemon zest in Greek Chicken with Lemon or onion soup mix in Homestyle Double-Onion Roast; elsewhere, packaged chili spice mix meets varying degrees of success. Bacon-Onion Potato Salad, which relies on reduced-fat Ranch dressing, is a rare miss, but the hits more than make up: Seared Chicken with Spicy Chipotle Cream Sauce, Roasted Sweet Potatoes with Cinnamon and Bourbon'd Filet Mignon-its rich sauce made with a deglaze of strong coffee-all beg for a turn. 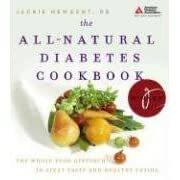 Nutritional and exchange information is supplied for each dish, and Hughes thoughtfully rounds out the book with useful all-purpose tips, like using low-carb vegetables to boost the volume of starchy dishes, adding instant coffee to deepen chocolate flavors and substituting equal amounts of cauliflower for potatoes. Those on a restricted diet will appreciate this wide range of simple dishes, as well as tips and tricks for enhancing everyday staples.